Whew, it’s been a while since I’ve said hello over here! The thing is that I went back to work for the first time since kids, and in a completely new job. So, I’ve been spending all my “free time” getting ready for my new venture. I started last week and am still here, so that’s good. I decided that it’s time to come up for air and think about sewing for a minute. Yay! This brings me back to the cliffhanger I left you with over a month ago (haha). 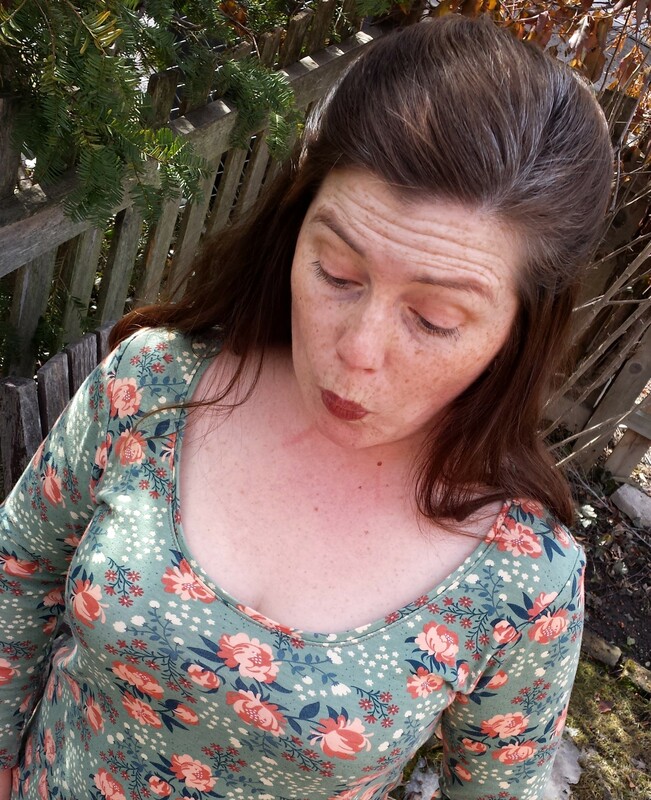 When we last were together, I told you about the holiday craft fair I participated in back in late November, and showed you the mess of Geraniums Dresses I made to sell. Well, I couldn’t leave the boys out completely, so I also made several gender neutral options. 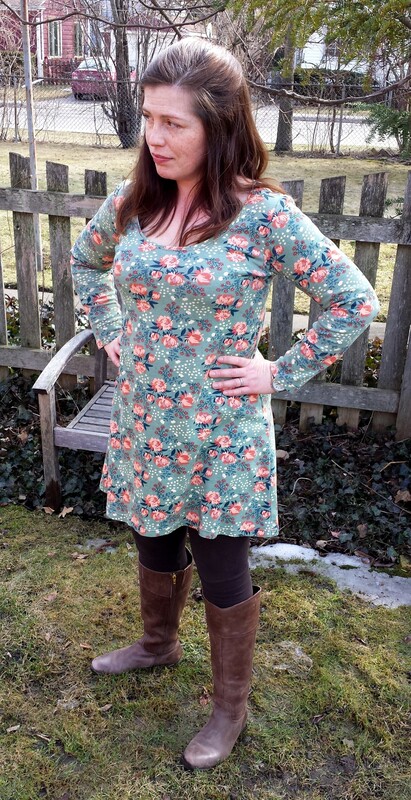 First up are three Charlie Tunics from Made by Rae. 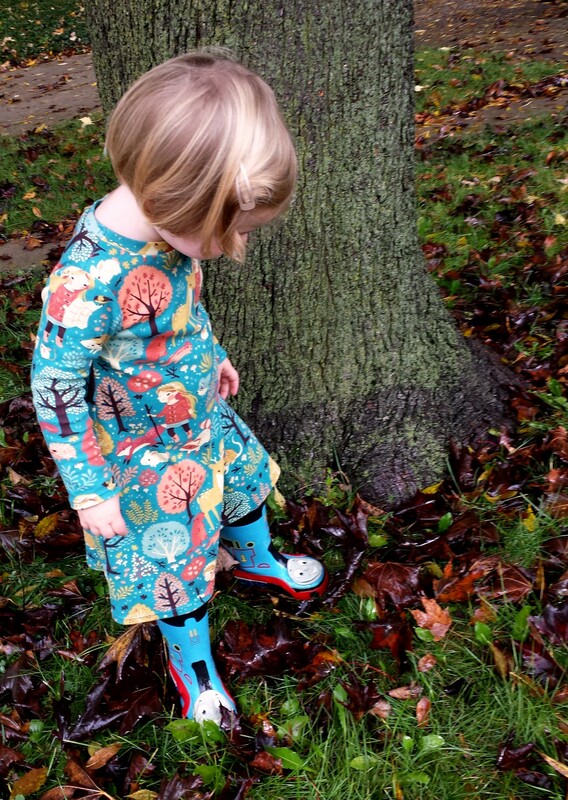 I also used this print in a Louisa Dress from Compagnie-M last year that still that gets lots of wear. It’s so nice to find more than one use for a great fabric. I love those gold buttons! Here’s Charlie No. 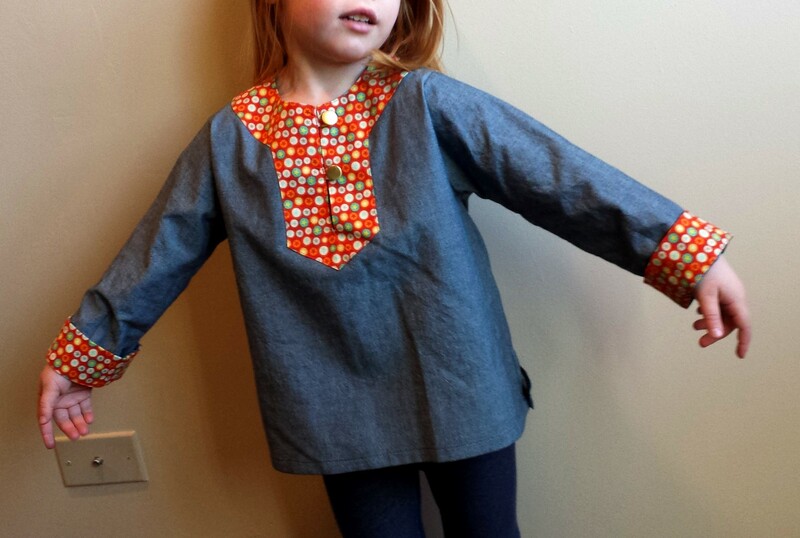 2, a 3T, in chambray and a random leftover from another project — from Joann’s I think. I love this pattern. It’s such a chic look for both girls and boys, and it’s a great way to use up the cherished leftovers of your favorite contrast fabric. You only need a fat quarter’s worth of fabric for the facings! 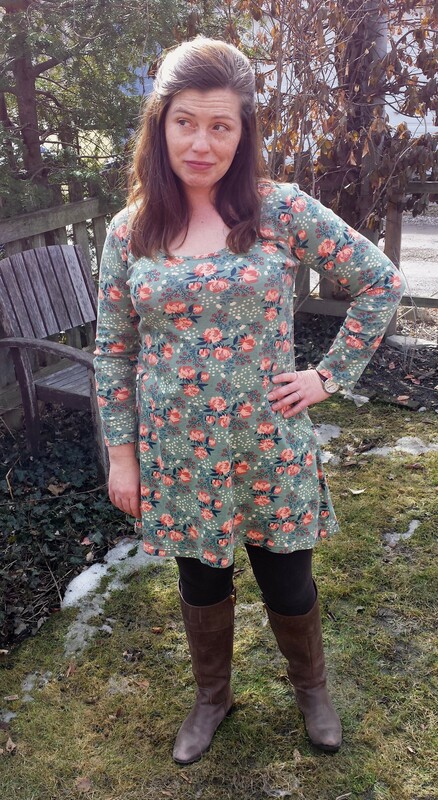 Rae also shows you how to convert this fab tunic into a very fun dress with a few adjustments. You can buy the add-on pattern on her site. 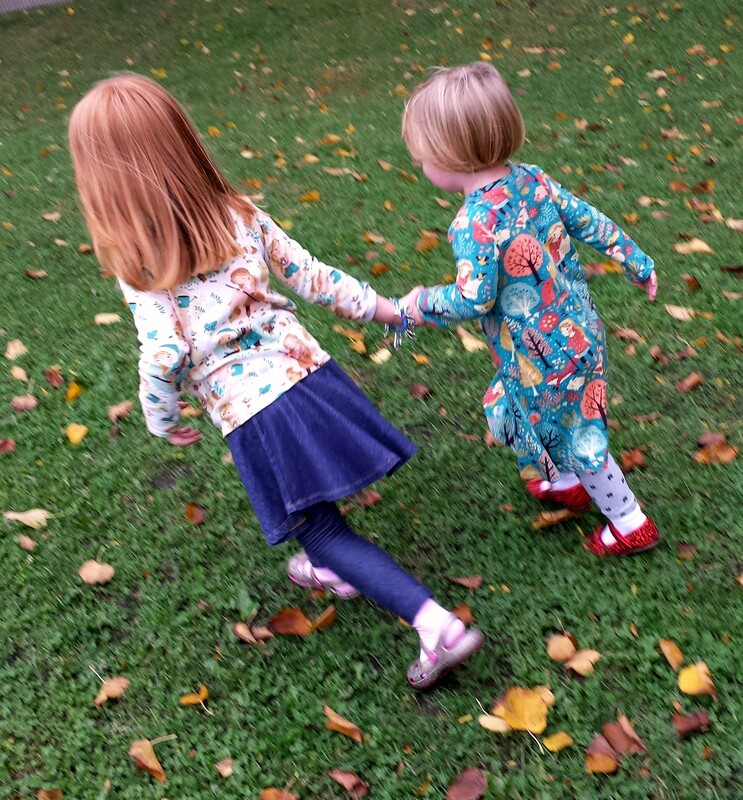 I made a couple of foxy flannel Charlie Dresses last winter for both my girls, which were cozy enough even for the dreaded polar vortex. I’m thinking about maybe some springtime Charlie Dresses in a few months. 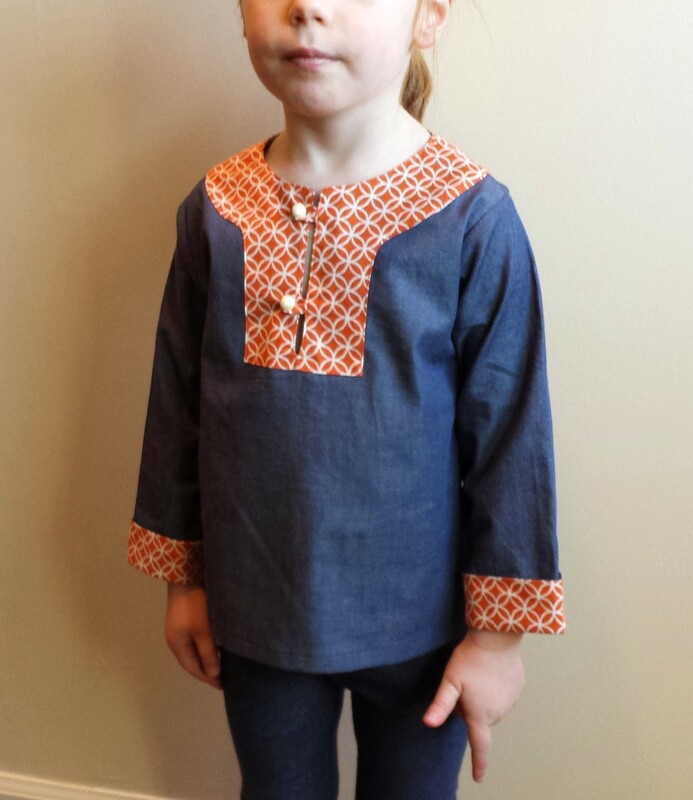 The last Charlie of the day is this 2T, modeled by the lovely Lulu, once again in chambray. I got fancy with the contrasting facings here and used Threaded Shreds in Mamey from the Indelible line. 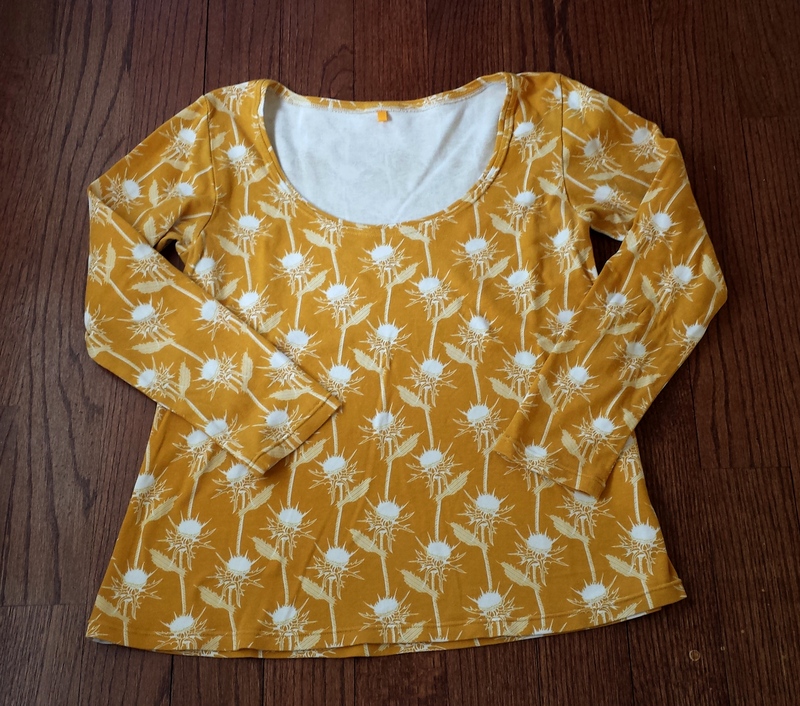 I bought a full yard of it for this top, so I have plenty leftover for another smallish project. Hooray! I also made a trio of long sleeved Flashback Skinny Tees. I’ve made millions of these and can whip them up in to time by now. What a great excuse to try out more of these wonderful Acorn Trail knits by Teagan White, and to use more Birch Organics elk in this gorgeous saffron color. At the sale, I actually got a “commission” for an elk tee in another size. 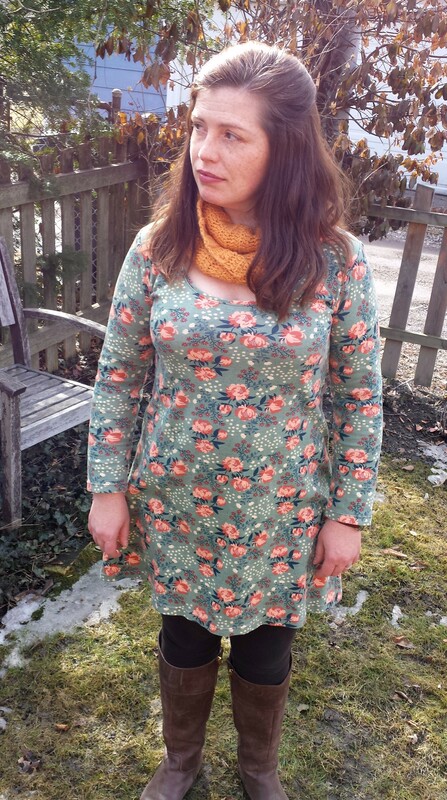 My last offering at the sale was this Skater Dress from Kitschy Koo in Gold Bugs Acorn Trail knit. 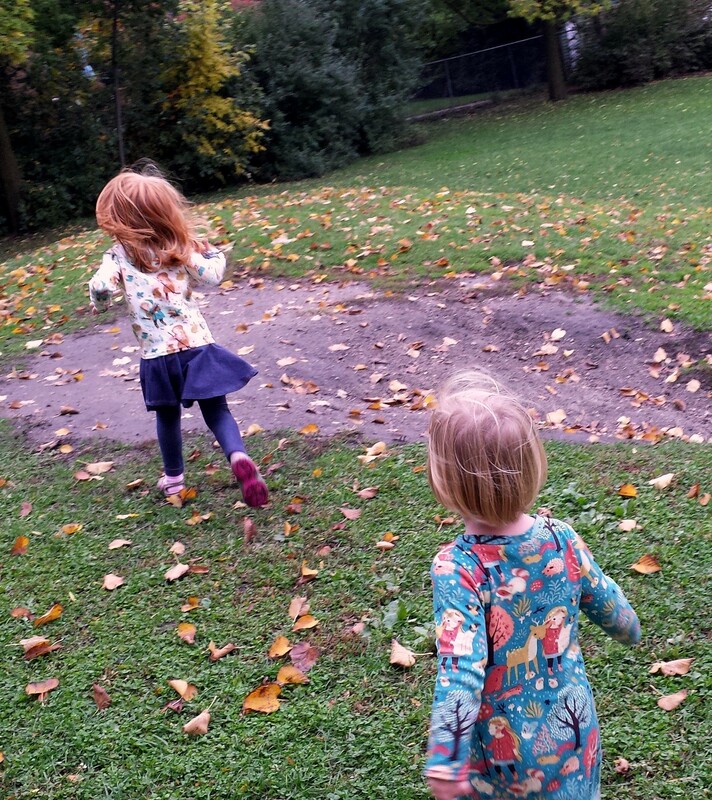 As I did in Lulu’s other, much beloved birdy Skater Dress — I cut the skirt 1 1/2 times wider than the pattern piece and gathered it, as suggested by Rachel of Stitched Together. I cut the bodice in 18m/2T, but shortened it a bit, and I cut the skirt at the 3T/4T length. I like to think that it would have fit Lulu quite well — but the world will never know. Ha. So, in the end, I sold about half the stuff I made. The rest will end up in Kiki & Lulu’s closet, or in the fund raiser auction for our preschool. 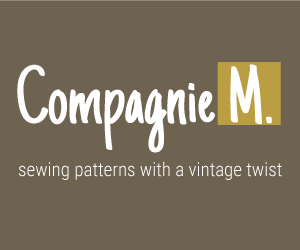 I never thought I wanted to make a habit of selling what I’ve sewn, and this experience didn’t change my mind. I’m glad I did it, but I think I’ll stick to sewing for my own little tribe for now. But, now that I’m working (part time, but still . . . ), the real trick will be finding the time to sew at all. It’ll happen. Everything in good time. Yes, yes — I like so many other sewers have vowed to sew only from my stash and to not be tempted by sparkly new offerings from our favorite fabric makers. 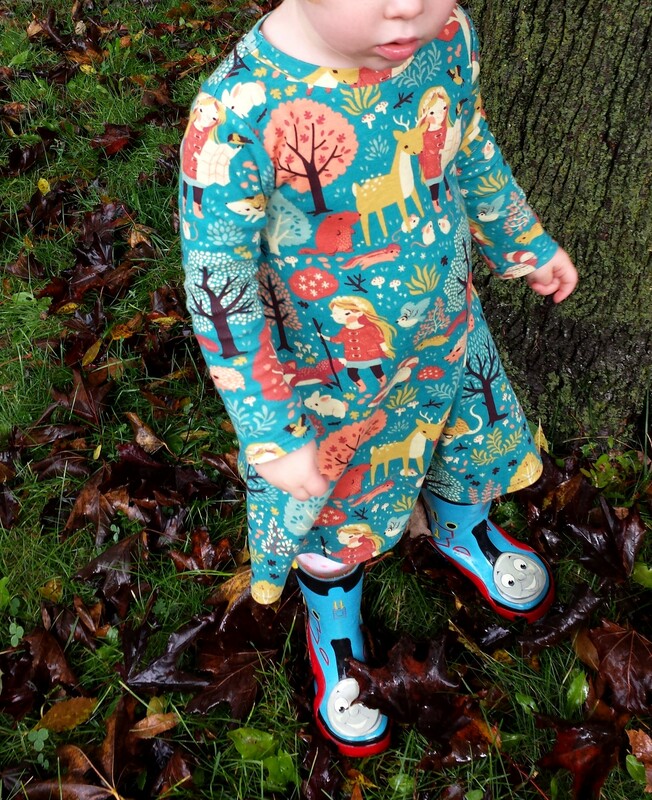 That was all well and good until I came across the new Acorn Trail by Teagan White for Birch Organics. Here you’ll find not only beautiful, vintage storybook-like illustrations in nostalgic autumnal colors — you’ll find them in luscious interlock knit! That’s right — nice, thick knit! 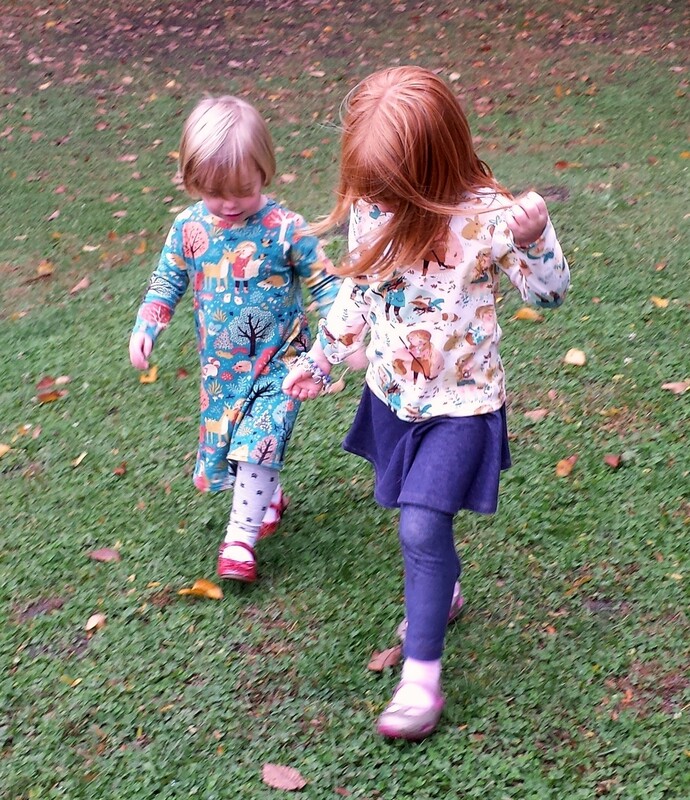 As the weather is turning cool around here, these fabrics were screaming to be made into something toasty for my girls. So . . . I caved. I ordered a yard of Acron Trail Penny’s Seasons and a couple yards of Nature Hike from Fabricworm. When these fabrics arrived in the mail, I was all a-flutter. They are as soft as anything you’d expect from Birch, and the weight of this knit is just right for fall and winter. Their thickness makes them easy to sew with, too. I tossed it all in for a pre-wash, rolled up my sleeves, and got right to work. 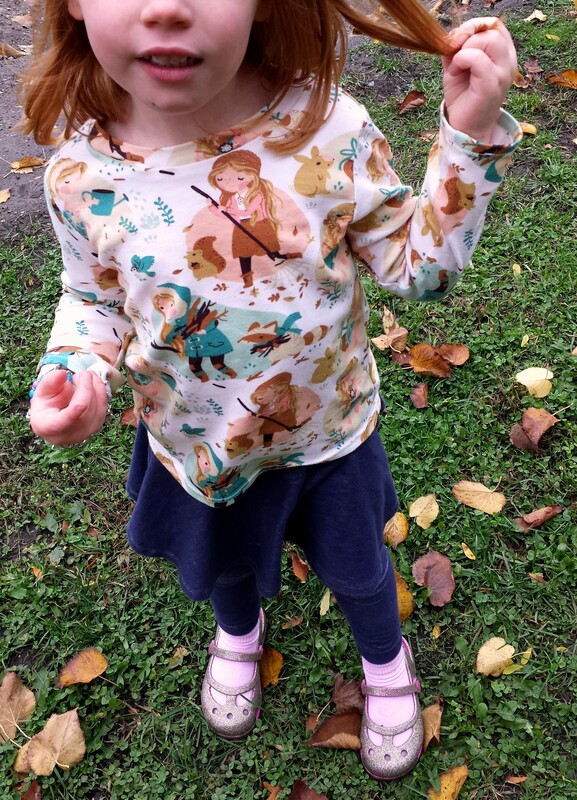 If I want to sew something that will surely be consistently worn by the most discriminating of preschoolers in my household, I turn to Rae’s Flashback Skinny Tee. 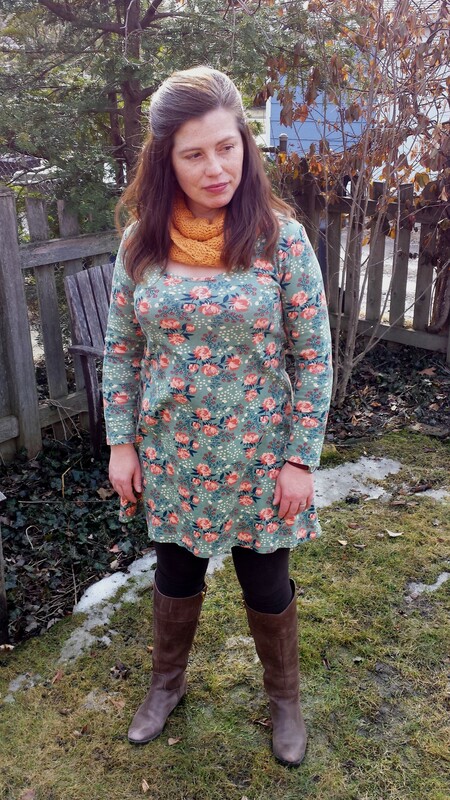 Nothing too fancy — just the perfect cozy shirt (or dress, as you will see or may already know). 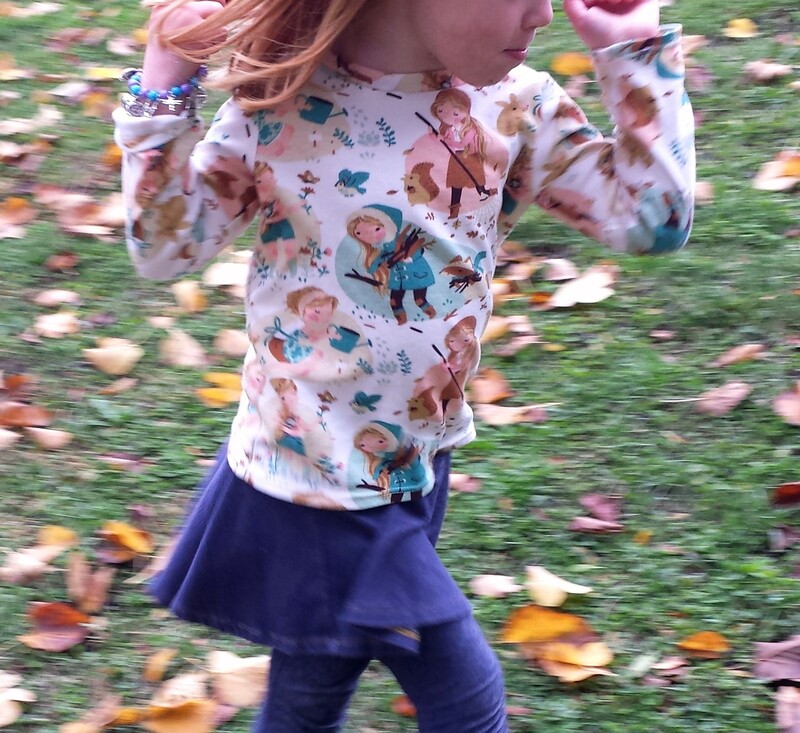 For Kiki, I sewed up a 4T, straight up long sleeved shirt with cuffless, hemmed sleeves. The fit is spot on, and it’s pretty much perfect. And, she wears it! The only change I made was to use Jess of CINO’s method of attaching the neckband that I picked up from making Nessie Tops last winter. 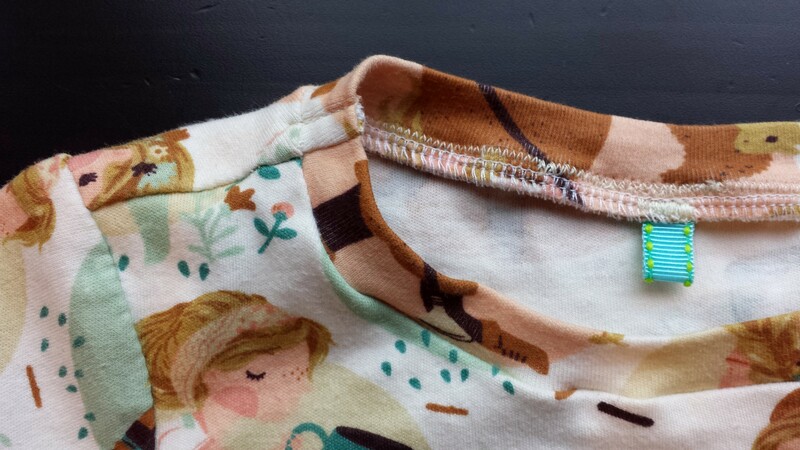 Using Jess’s method, you attach the neckband as a long strip before sewing it together into a loop, and before sewing the second shoulder seam. 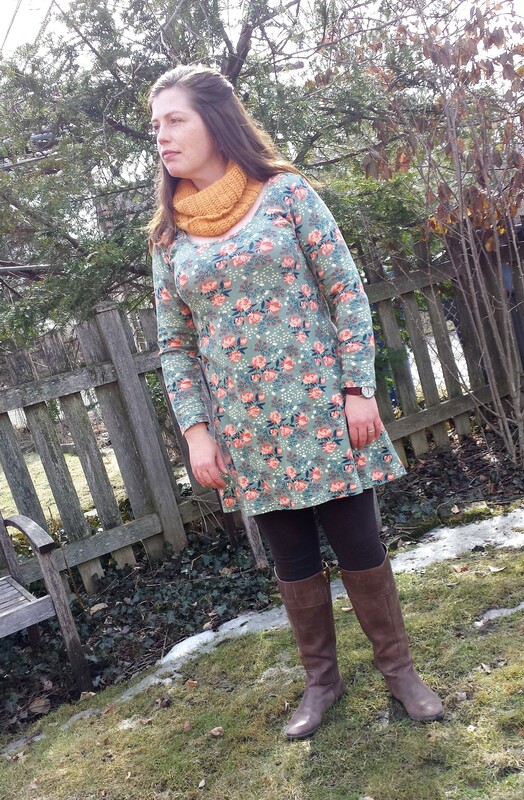 This way, you don’t have to stretch it to exactly fit the already sewn together neckline. I find that you don’t even need to pin it before you sew. Just gently stretch the neckband and sew carefully, matching it up with the neckline as you go. The only drawback is that you have the seam allowance from the neckband hanging out at the second shoulder seam. But, all you need to do is tack it down right by that shoulder seam. I think it looks just fine and is way faster and less fiddly to put together. 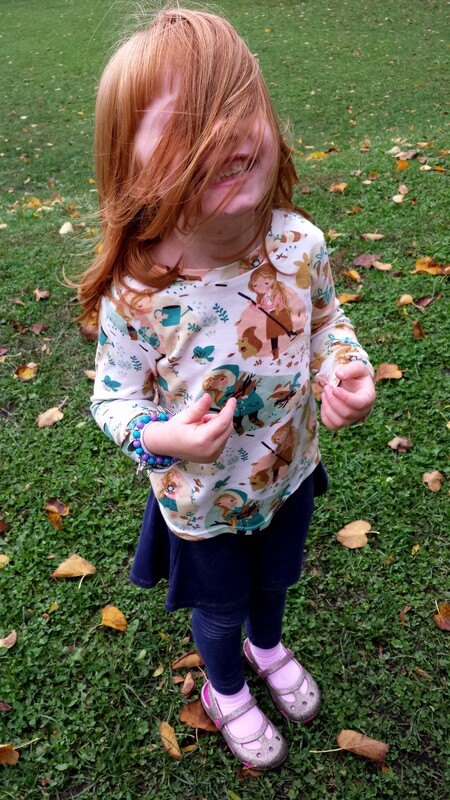 For Lulu, I followed Rae’s tutorial on making this tee into a super chic dress. There’s really nothing to it — just add as much length as you want, flair out the skirt a little and round the edges of the hem at the side seams. 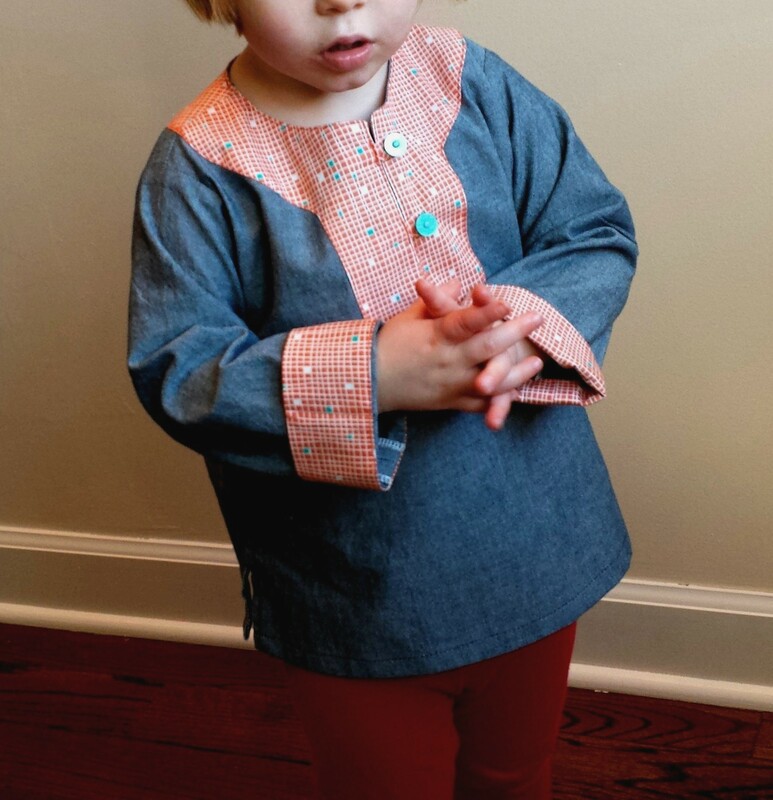 This is a 2T, with enough length to last her a while — I hope! 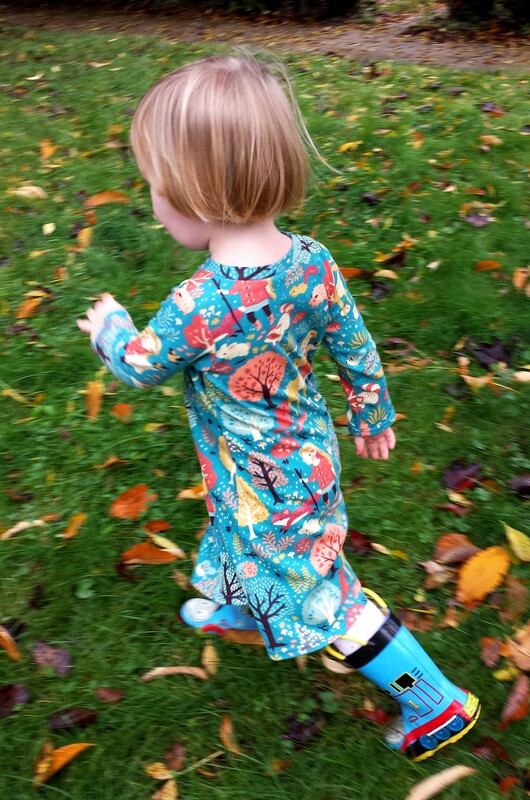 One of the other parents at preschool described this dress as “delicious” yesterday. That pretty much made my day — especially since she didn’t know that I made it (wink, wink)! There’s more to the Acorn Trail collection. Check out the bugs in gold and blue. You may be seeing more of that here before long. 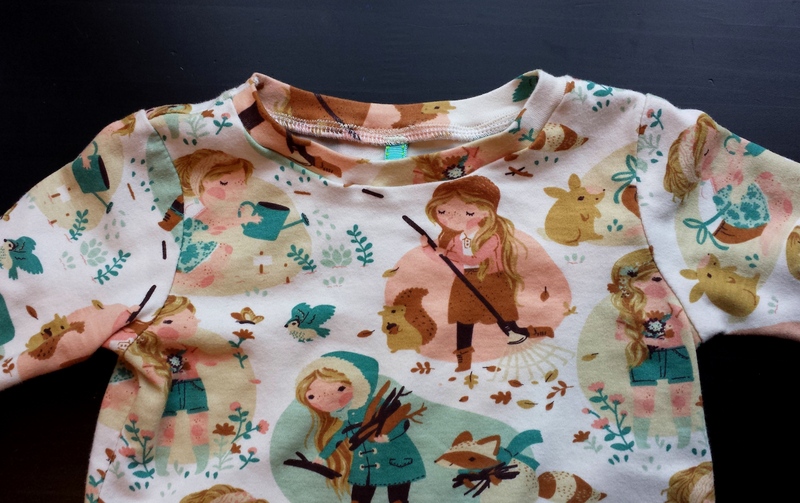 In the meantime, we’ll be channeling our inner woodland creature . . .